President Donald Trump's brand new Secretary of State Mike Pompeo came to NATO on Friday to hammer home one of his boss's oldest themes -- demanding that other members pay their way -- as the allies sought a common front against Russia. There was broad agreement in Brussels on the need find ways to counter Russia's adoption of "hybrid warfare" techniques -- subversion, propaganda, cyber warfare -- to undermine the West without triggering a full NATO military response. But divides remain on spending commitments, with Germany in particular holding out against the large military spending increases demanded by Trump, and on how to balance a stern response to Moscow with keeping open a door to dialogue. 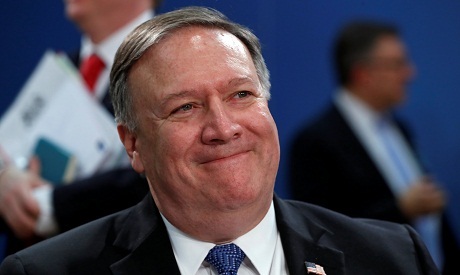 Welcoming former CIA chief Pompeo to the NATO headquarters less than 24 hours after the top US diplomat was sworn in, NATO Secretary General Jens Stoltenberg spoke of the need to adapt the 29-member Western alliance "to a more demanding security environment." Noting that the talks were the first NATO ministerial meeting since Russian agents allegedly used a nerve agent to poison a double agent in the English town of Salisbury, Britain's Foreign Secretary Boris Johnson summarised the dilemma. "How do you deal with a military environment in which attacks come below the threshold of the Article 5 commitment to mutual support but do demand a common response?" he asked, referring to the alliance's mutual self-defence pact. Stoltenberg said much of the alliance's military expansion in the Baltic was geared towards countering hybrid threats, and ministers discussed how to do more, but concrete proposals are not expected before July's NATO summit. "As we prepare for the summit we wil look at how we further strengthen our ability to respond to those threats which don't trigger Article 5 but at the same time are a challenge to NATO allies," Stoltenberg said. Pompeo's US delegation came out satisfied with the discussion on Russia. "There was consensus on Russian aggression, the scale of Russian aggression and this being a problem that requires a response," a senior State Department official told reporters after the session. But Pompeo brought a second, tougher message on the need for other member states to increase their military spending and thus reduce the burden placed on the alliance's biggest member. Some allies, most notably wealthy Germany, are reluctant to meet a commitment made at a NATO summit in Wales in September 2014 to spend at least two percent of their GDP on defence. Trump has repeatedly declared this to be tantamount to countries not paying their dues, and Pompeo carried this message to Brussels as his predecessor Rex Tillerson had done. But, as he arrived, Germany's new Foreign Minister Heiko Maas stressed the contribution Berlin was making to humanitarian work in Syria and to Iraq. "Germany plays a very important role," Maas said. Before the talks began, US diplomats had singled out Germany -- which spends only 1.24 percent of its large GDP on defence -- for criticism. After the first session, the US official was more guarded. "There was a consensus by all countries to deliver their plans, including those who have not yet done so," he said. Luxembourg's veteran Foreign Minister Jean Asselborn told AFP Pompeo had got his point across without causing upset. "Mike Pompeo of course insisted on the need for burden-sharing, but he did it without aggression," Asselborn told AFP. "On the contrary he was attentive, he listened and took part in all the discussions." As the ministers meet in Brussels, German Chancellor Angela Merkel will be in Washington for a much-anticipated meeting with Trump, hard on the heels of French President Emmanuel Macron's triumphant three-day state visit. France and Britain took part in a recent US-led punishment strike against Syrian President Bashar al-Assad's chemical arsenal, but Germany has not joined recent missions and Merkel's meeting will be less warm than Macron's. Stoltenberg will say a few words to mark the end of the final meeting of ministers in the historic North Atlantic Council room where Article 5 was invoked for the first and only time, after the September 11, 2001 attacks in the United States. Ministers will also debate plans to expand NATO's training mission in Iraq. Details will be confirmed at the summit in July, but Stoltenberg said it would involve several hundred personnel. After his time in Brussels, Pompeo will head to the Middle East, with stops in Israel, Jordan and Saudi Arabia -- countries chosen to reflect what his spokeswoman called "importance as key allies and partners in the region.